Finally, prosecutors can get checks from large merchants. Prosecuting Attorneys have always sought to serve large national retailers. No single prosecutor could influence these companies to use his or her program. It is nearly impossible for a prosecutor to even get a large retailer’s attention. But, now, there is a source of checks from many of the country’s leading retailers. Check Connection is that source. 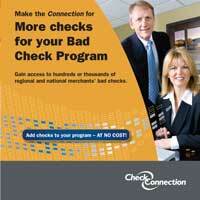 Prosecutors can tap into the flow of checks from large retailers with no reduction in fees and no additional hassle. You keep all your fees. You handle the cases just like any others. Check Connection assures you get clean cases that meet your particular criteria. I'm a Merchant. What do I do?